Temporary Housing 101: What Is a Workforce Shipping Container Home? How is your temporary housing constructed? Our container homes are repurposed ISO shipping containers, also known as Conex boxes. The boxes are made from corrugated, Corten steel and designed for the rigors of open-ocean travel. At Falcon, we refurbish these prefabricated units into the most durable, cost-effective, portable housing options available. Is your temporary housing portable? Yes! Deploying our workforce housing units is fast and easy. We can deliver to just about anywhere in the Continental United States. And setup only requires a flat surface with ample square footage (floor-plans are available in 40-foot and 20-foot lengths). 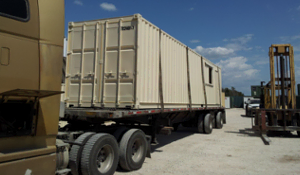 If your jobsite moves, our container housing is easy to pack up and relocate. Can temporary housing be modified? In addition, we can work with you to create specific modifications based on your team’s needs. And if your workforce expands, we can help you create containers additions—either stacked or joined. Why use Falcon for temporary workforce housing? We have more than 10 years of experience in executing modified shipping container housing projects. Our team includes engineers, designers, and dedicated service professionals. And our client list speaks to our capabilities and professionalism. Have questions? Contact us at 877-704-0177 or sales@falconstructures.com.